Kelburn Estate Glamping in Fairlie offers a range of luxurious yurts to stay in. Our glamping site in Ayrshire is situated in a stunning hillside setting, perfect for a tranquil break away. All of our homely and cosy yurts are beautifully furnished and come with a range of excellent facilities. 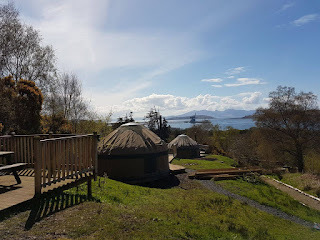 Each yurt enjoys glorious views of the Firth of Clyde and Isle of Arran. 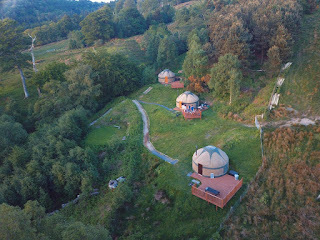 There are 3 sites in this area, with each housing a spacious 5m yurt. There is no electricity on site. Each yurt has a small solar panel powering 2 internal lights. There is a drinking water tap. A compostable loo can be found beside the glamping site, and there is a toilet block with hot showers approximately 200m from the site. We also have bell tents available for hire which are spacious and comfortable. Pitches for tents, campervans, caravans and motorhomes are available.